Once again Dodge has tapped the supreme dramatic acting abilities of Vin Diesel in its latest ad, entitled "Winning’s Winning," to promote the new Challenger Demon. The 30-second spot is the fourth Dodge commercial starring Diesel, following the three "Brotherhood of Muscle" spots before it, which touted the Challenger, Charger, and Durango SRT, among others. The premise is simple: first one across the finish line is best. In the video we see not only the drag-focused Demon, but also the Charger and Challenger, taking on their own variations of the hypothetical race course. The commercial is capped off with Diesel driving the Demon across the finish line, with the whine of the supercharged engine in the background, followed by the tagline, "Domestic. Not Domesticated." This is the second ad spot for the new Dodge Demon, following "The Truth" that debuted a few months prior, but the first with Vin Diesel at the helm. And both are appropriately aggressive; the Dodge Challenger Demon is an 840-horsepower (626-kilowatt) muscle car of epic proportions, in case you’ve already forgot. The Dodge Demon comes powered by a 6.2-liter supercharged V8, and has the ability to sprint to 60 miles per hour (96 kilometers per hour) in just 2.3 seconds, making it one of the quickest cars available on the market today. 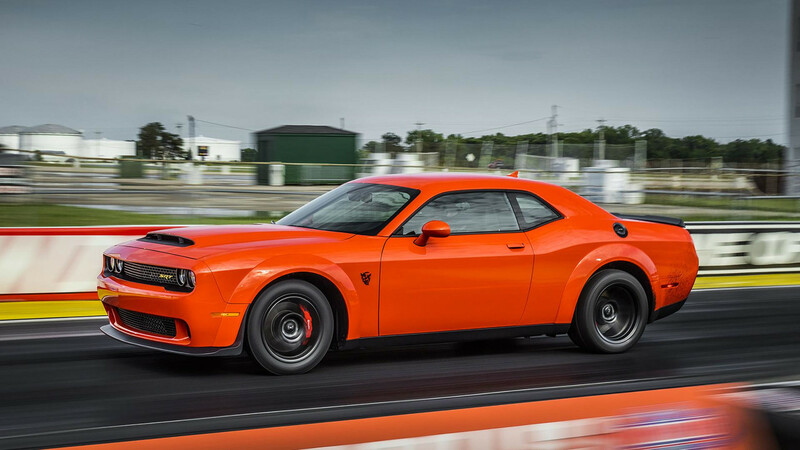 Running on 100-octane fuel, the Demon produces 770 pound-feet (1,044 Newton-meters) of torque at 4,500 rpm, and redlines at 6,500 rpm to accommodate the higher horsepower peak, versus the 6,300 rpm available in the Hellcat. All that power can be had for just $86,090 (including gas guzzler tax and destination), with deliveries scheduled to begin later this fall. If you’re worried about paying a premium (similar to the Hellcat), Dodge says that it will allocate lower serial number cars to dealerships willing to sell at or below MSRP. Just 3,000 examples of the Demon will be built in the U.S., with another 300 being built for Canada.